Today, I'm taking a behind the scenes look a the red ballgown Scarlett O'Hara wears in Gone With the Wind (1939). This article is the fourth in a four-part series. Go here for part one, part two, and part three. One of Gone With the Wind costume designer Walter Plunkett's greatest challenges was creating historically accurate fashions for the roughly 15 year time period in which the movie takes place. Plunkett had to start out with the wide hoop skirts and ruffles of the Antebellum period (see weeks one and two) and then move on to creating rags and homemade attire for the hard times of Reconstruction (see week three). The final third of Gone With the Wind (1939) occurs during the 1870's. This period in American history is known as The Gilded Age partially because of the ornate designs that were favored in both fashion and interior design (Scarlett and Rhett's Atlanta mansion is a prime example of the era's over the top style). Women's fashions, as exemplified in magazines like Godey's Lady's Book, moved away from the ruffles, hoop skirts, and light fabrics of the Antebellum period to feature body-hugging designs in rich materials like velvet. 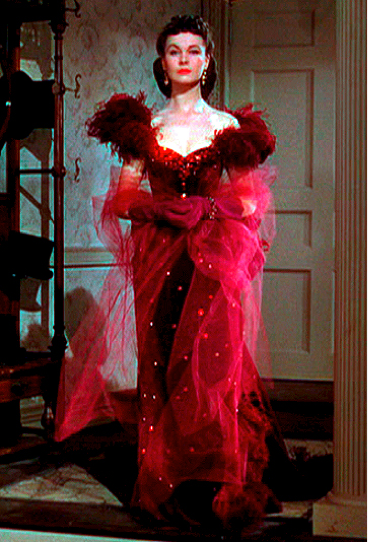 Plunkett's design for the red ballgown is both a beautifully crafted example of the Gilded Age style, and an important symbolic moment in the movie's plot. Plunkett created the gown from a rich burgundy velvet that he hand sewed with garnets and trimmed with wine-colored ostrich feathers. The striking ensemble was accessorized with a wine-colored veil and gloves and a pair of garnet drop earrings. Scarlett wears the red ballgown to Ashley Wilkes birthday party in GWTW, and the daring ensemble is an important part of the movie's story line. Scarlett, who carried a torch for the married Ashley for the best part of a decade, is caught giving him a friendly hug by Ashley's sister, India (Alicia Rhett) and Mrs. Meade (Leona Roberts), who spread rumors about Scarlett's inappropriate behavior throughout Atlanta society. 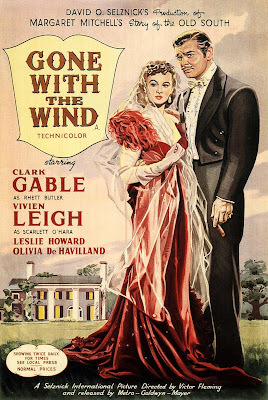 Scarlett tries to skip the birthday party by feigning a headache, but an infuriated Rhett Butler (Clark Gable) forces his wife to attend in an ensemble that makes her a living embodiment of a "scarlet" woman. 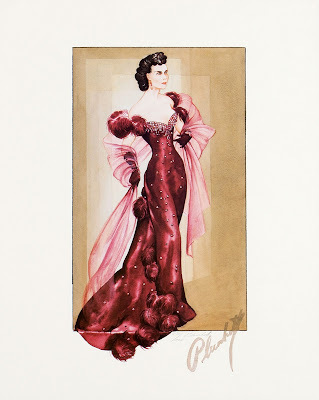 Walter Plunkett's sketch of Scarlett O'Hara's red ballgown. It's difficult to understand in this age of flip-flops and cargo pants, but Gilded Age society had strict rules about appropriate clothing for all types of events. Rhett, who in both the novel and the movie was an expert on women's clothes, was trying to humiliate Scarlett with his choice of clothing. Scarlett's red ballgown, with its plunging neckline and off the shoulder design, would not have been appropriate attire for a birthday party, as viewers can easily tell from the dresses the other women were wearing. Ironically, Scarlett's red ballgown has inspired more modern fashion than the other GWTW looks I featured in this series. A glance through Pinterest shows gowns by designers like Zac Posen and Vera Wang that are similar to Scarlett's dress.